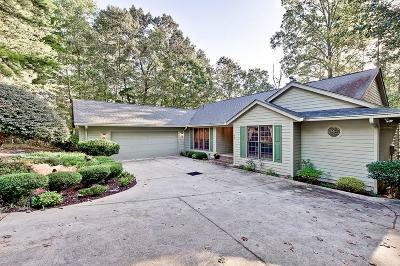 A beautiful, well cared, comfortable home in the wonderful gated community of Keowee Key with four bedrooms, two full baths and two half baths. This home is designed for everyday living on the main level yet with plenty of extra space on both the upper and lower levels for whatever you might need. The entry hall, living room and dining room are an open floor plan that makes the main living area more functional and welcoming. The well laid out kitchen with granite counter tops boasts a center island with a salad sink station and lots of custom cabinetry. A walk-in pantry has ample space to store all the extra food and staples you will ever need. Off the hallway leading to the 2 Â½ car garage is the laundry room equipped with a sink and lots of cabinets. There is also a small room the current owners us as a computer room but it could also be a wonderful extra pantry room or appliance storage room for those seldom used, but necessary, appliances so often found in todayâs kitchens. The lower level is centered on a large recreation/common room equipped with a fireplace surrounded by brick. The wet bar and refrigerator make entertaining in this area easy and convenient. Two lovely bedroom suites, one on either side of the rec room, are there for family and guest to enjoy. A multi-purpose room off the rec room is ideal for use as an office or craft room. The spacious unfinished area of the lower level is equipped with a workbench and numerous shelves for storing those seldom used things. The curved concrete driveway is surrounded by an easy to maintain yard beautifully designed and planted with loving care by the owners. An in-ground irrigation system makes caring for the many shrubs and blooming plants a snap. The area behind the house is covered in mixed hardwood trees and home to all sorts of wildlife. If a low maintenance, natural habitat is what you desire, then this is the place for you.